Cataracts are the leading cause of blindness worldwide, accounting for 13-27% of cases. Kohl-Chikni Dawa (KCD) is reputed for its beneficial effects in the treatment of premature cataracts. However, its efficacy is yet to be tested. To investigate the rationality of the therapeutic use of Kohl-Chikni Dawa (KCD) in Unani medicine. The effect of Kohl-Chikni Dawa eye drops on naphthalene-induced cataracts in rats was investigated by slit-lamp biomicroscopic analysis. The normal group of experimental animals was administered with mineral oil (orally), while other groups were given naphthalene (orally) along with local application of KCD eye drops (once and twice daily), placebo and distilled water (twice daily). Initial morphological changes of the lenses were observed twice a week for two weeks, and thereafter once a week for four weeks. 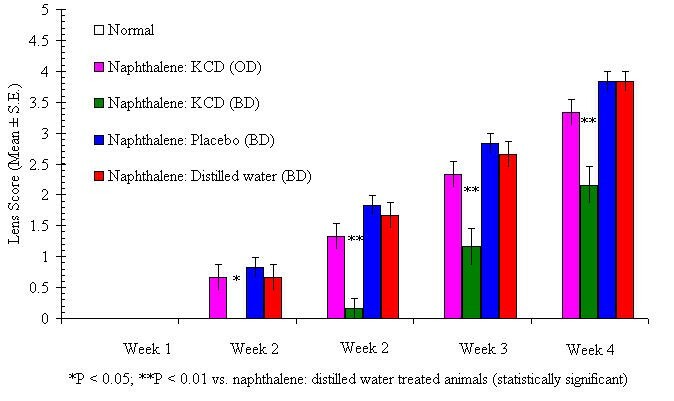 Local application of KCD (twice daily) caused significant reduction in the lens opacification after 2 to 4 weeks of naphthalene administration. KCD eye drops may have the potential to delay progression of naphthalene-induced cataracts in rats. In 1995, it was estimated that 38 million people in the world i.e., 0.7% of the total population are blind, while an additional 110 million people have visual impairment. Cataracts are still a major cause of blindness, accounting for 13–27% of the blind people, strongly increasing with age . Cataract formation is one of the irreversible processes for which modern medical science has no definite cure except surgery. Drugs that may have prophylactic or curative effects for cataract are lacking. Ingestion of naphthalene can cause cataract in man  as well as in experimental animals [3–5]. Uyama et al suggested that naphthodiquinone, an oxidation product of primary ingested naphthalene, is the cataractogenic substance . The morphology of these cataracts has prompted some to suggest that experimental naphthalene cataracts may be a good model for human age-related cataracts . Kohl-Chikni Dawa (KCD) is a compound herbo-mineral ophthalmic formulation (Kohl, Surma) of Indian origin (invented by Hakeem Shareef Khan) used in Unani medicine . The drug is reputed for its beneficial effects in the treatment of premature cataract [9–14] with the fact that no adverse effect or reaction is reported in the Unani literature about the drug. However, claim of its efficacy is yet to be scientifically substantiated. The present study was therefore undertaken to investigate the effects of KCD in naphthalene-induced cataract in rats by adopting the method of Guo-Tong Xu et al . The ratio (1:20:1) of the constituents used in KCD includes copper sulphate (S.D. Fine Chem. Ltd. Mumbai), Hard soap (M. S. factory, Aligarh) and resin of Shorea robusta (collected from market and authenticated at Department of Chemistry, Faculty of Science, Hamdard University, New Delhi). Naphthalene (CDH Pvt. Ltd., New Delhi), mineral oil (S. D. Fine Chem. Ltd, Mumbai) and Tropicacyl plus (Tropicamide 0.8%, Phenylephrine 5%) (Sunways Pharmaceuticals Ltd.). Mustard oil smoke-ash solution in distilled water (self-prepared) was used as placebo drug. KCD was prepared after proper identification and quantification of the constituents under aseptic conditions as per the method described [16, 17]. Hard soap was cut into small pieces and heated in an iron pot. As the soap started to melt, copper sulphate was added and allowed a complete liquefaction. Resin powder of Shorea robusta was then added and heated till the drug got burnt and converted into dry ash. After cooling, the drug was powdered by using a grinder and filtered through a sieve (size 120μ). The filterate (micro-fine powder) was collected in a bottle and labeled as Kohl-Chikni Dawa. Fresh solution (3%) (1 ml contain 45 mg) of KCD in distilled water was prepared before instillation. Fifty albino rats (female, 100–130 gm.) bred in the Central Animal House Facility of Hamdard University were used for the study. The animals were housed under standard laboratory conditions with food and water provided ad libitum. Experiments were performed between 09:00 and 17:00 hrs. The animal ethics committee of Hamdard University approved the study protocol. Cataract induction was achieved by oral administration of Naphthalene solution (10%), which was prepared in warm mineral oil by heating at 60° C for 30 minutes. This solution was administered orally by using 18-gauge needle at 0.5 gm/kg for 3 days and 1.0 gm/kg thereafter, for 4 weeks. One drop of 3 % KCD solution was applied locally in both eyes daily, once a day and twice a day (at 9:00 and 17:00 hrs) just after the naphthalene administration. Typically, the experiment included 5 groups (oral: local): (I) mineral oil: distilled water; (II) naphthalene: KCD (once a day); (III) naphthalene: KCD (twice a day); (IV) naphthalene: mustered oil smoke-ash (twice a day) and (V) naphthalene: distilled water (twice a day). Morphological changes in the lenses were monitored by slit-lamp (Major Surgical Co.) after dilating the pupils by Tropicacyl plus. The lenses were examined twice a week during the first two weeks and thereafter at weekly intervals for four weeks. The lenticular opacities were graded with an arbitrary 6-score grading system as follows: 0, clear lens; 1, watercleft and spoke-like opacities (<0.5 of the shell); 2, watercleft and spoke-like opacities (>0.5 of the shell); 3, opacities merged to form a shell (thin, grey colour); 4, shell partly thick and white; and 5, shell fully thick and white. Presence of opacification was confirmed in all lenses after excising and examining them under a dissecting microscope. The slit-images of 6 eyes in each group were used for statistical analysis. Due to high mortality rate (about 30 % in each naphthalene-fed groups), data of 6 animals were expressed as mean ± S.E.M. Non-paired student's t-test was used to analyze significance of the two means. Probability level of less than 5% was considered as statistically significant. All naphthalene-fed rats developed cataract with similar morphological characteristics although the rate of development varied with different groups. Under slit-lamp examination, waterclefts and spoke-like opacities in the cortex could be seen after two weeks in groups II, IV and V and by the fourth week these features merged to form a partly thick and white shell in the deep cortex region and did not produce fully thick and white shell in any group. The opacities appeared creamish or light yellow on examining the lenses after their removal from eyeballs. The animals of Gp. III treated with KCD (twice daily) developed waterclefts and spoke-like opacities in the cortex at the end of the third week and did not produce any thickening and opacity of the shell. After removal from the eyeball these opacities gave a ground-glass appearance. Comparing the morphological development of cataracts in the groups II, III, IV and V rats during four weeks of naphthalene feedings, the Gp. IV and Gp. V rats showed a similar rate of cataract formation. The rate of cataract development was slightly faster in Gp. IV and Gp. V than in Gp. II and Gp. III. The Gp. III rats developed cataract at a slower pace than those of other groups, the difference being statistically significant (p < 0.05; p < 0.01). Gp. I rats treated with mineral oil only remained clear during the four week treatment (Figure 1). Some systemic disorders, including diarrhoea, weight reduction, brownish colour of hairs and high mortality (about 30%), were observed in the naphthalene-fed animals. None of these extra-ocular effects was prevented or ameliorated by KCD eye drops. Effect of Kohl-Chikni Dawa eye drops on naphthalene-induced cataract in rats. In the long-term pharmacological treatment of cataract safety considerations are of primary concern. To reduce the side effects of long-term drug therapy and to achieve a sufficient concentration of drug penetrating the lens, topical administration is more effective than systemic administration . Since the progression of age-related cataract in humans is slow, the anti-cataract drug must be applied for a longer duration, as we used KCD eye drops during this study. The study revealed that application of KCD eye drops twice a day significantly inhibited lens opacification in the naphthalene-induced cataract. The mechanism of this inhibition remains unclear. Standardization of KCD, containing 1.208% copper as one of the components, has been discussed earlier . We presume that cataract inhibition by KCD could be mainly due to the presence of copper in it; as Balaji et al  suggest that copper is necessary for normal physiological function and is required for the activity of numerous enzymes such as cytochrome oxidase, super-oxide dismutase and uricase. The excess of copper in cataractous lenses may oxidize sulfhydryl group to disulfides followed by a reduction of copper that may generate oxygen radicals. The role of copper in cataractogenesis has been reported variously. In one study, the copper level in the cataractous lenses in vertebrates showed no correlation between copper level and cataract, and found no difference in copper levels between normal and cataractous lenses . Low level  as well as elevated level  of copper has been observed in the cataractous lenses. The elevated level of copper in the lens has been shown to inhibit the activity of lactate dehydrogenase, which is thought to be a sensitive marker of cataract formation . Thus, whatever be the role of copper in cataractogenesis, it is suggested that application of 3% KCD eye drops twice a day may prevent naphthalene-induced cataract in rats. Moreover, KCD eye drops may also prove to be a useful drug for age-related human cataract. Our findings suggest that local application of 3% KCD eye drops has an anti-cataract effect in naphthalene-treated rats. Thus, the reported claim about the efficacy of this drug finds support from this study. That the drug has long been in use of peoples is indicative of its being non-toxic. However, drug penetration tests and controlled clinical trials need to be carried out to confirm its anti-cataract activity and general safety. The authors are thankful to the Department of ISM & H, Ministry of Health & Family Welfare, Govt. of India, for providing financial assistance to carryout the study. TA – Supervised the design and coordination of the study. SZ – Participated in the design of the study and performed the statistical analysis. NI – Participated in sequence alignment and the drafting of manuscript. AN – Participated in dosing of animals and the application of KCD. ZZ – Carried out slit-lamp biomicroscopic analysis. SH – Participated in sequence alignment, design and coordination.